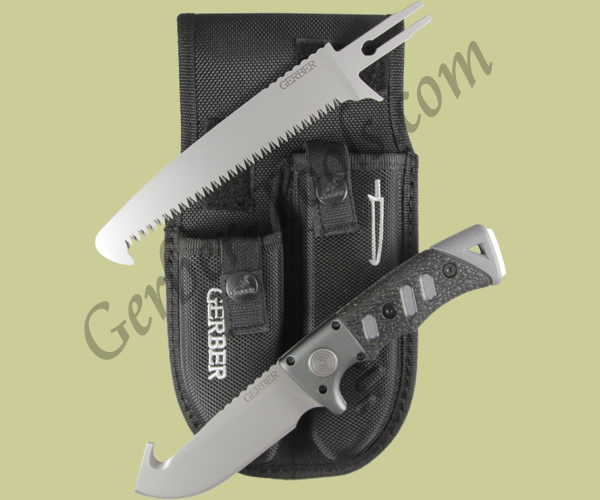 The Gerber Metolius Exchange A Blade 30-000697 offers the choice of a fine edge gut hook blade or a durable utility saw blade. Changing the blades is accomplished with the push of a button. The handle has a TacHide inlay that allows you to keep a firm grip in all conditions. A pommel has been built into the end of the handle. The Gerber Metolius Exchange A Blade comes with a paddle style nylon sheath for convenient storage and carrying.